Cendrine Rovini’s exhibition, Liquide Vermeil, takes us into an emphatically feminine world where female images reign. First off the proverbial relationship between women and blood. A rich and intimate mystery which has the power to fascinate man but whose deepest meaning constantly eludes him. 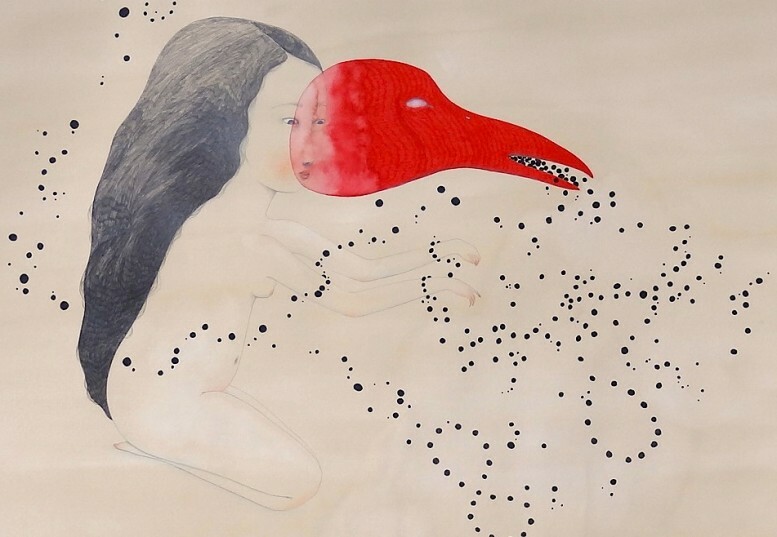 The artist presents her creatures as strangely beautiful women who play with and enjoy their own femininity to the point of intoxication. An overflow of blood become flowers, a flow of tears become hair, a face rain, horns erupt in the shape of delicate, wild plants. Liquide Vermeil is on view at the Da-End gallery in Paris from December 15 to February 15, 2012, 17 rue Guénégaud 75006.